Crocosmia Lucifer is one of the hardiest and easiest of garden plants. 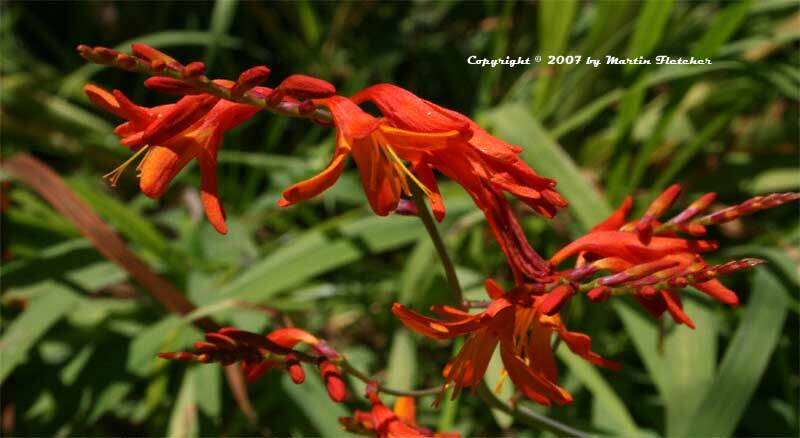 Amongst the common names Montbretia comes up, but it is used less than the genus name Crocosmia. Crocosmia will bloom in sun or shade. It requires only a little additional water in the driest gardens. Crocosmia Lucifer will bloom through the latter part of Summer and into the Fall. With these Autumnal colors it fits well in a garden with the turning leaves. Crocosmia Lucifer is hardy to single digits. With a plant this easy there is often a caveat. They are not so easy to get rid of if you change your mind. Lift them soil and all to get all of the little bulblets left behind. Crocosmia Lucifer will grow to 2-3 feet in height and will have an ever growing clump. I cut Crocosmia Lucifer back nearly to the ground as I am pruning roses. Flowers and foliage of Crocosmia Lucifer. High resolution photos are part of our garden image collection.